AmeriSync is a tool written by the AmeriCommerce online stores team. Its purpose is to pull order and product information from AmeriCommerce online stores, and sync them to an existing QuickBooks database. AmeriSync - Created by the AmeriCommerce developers, this is a standablone program that will pull information from your storefront to your QuickBooks file. Amerisync requires a separate purchase to be used. Find out more details on pricing here. 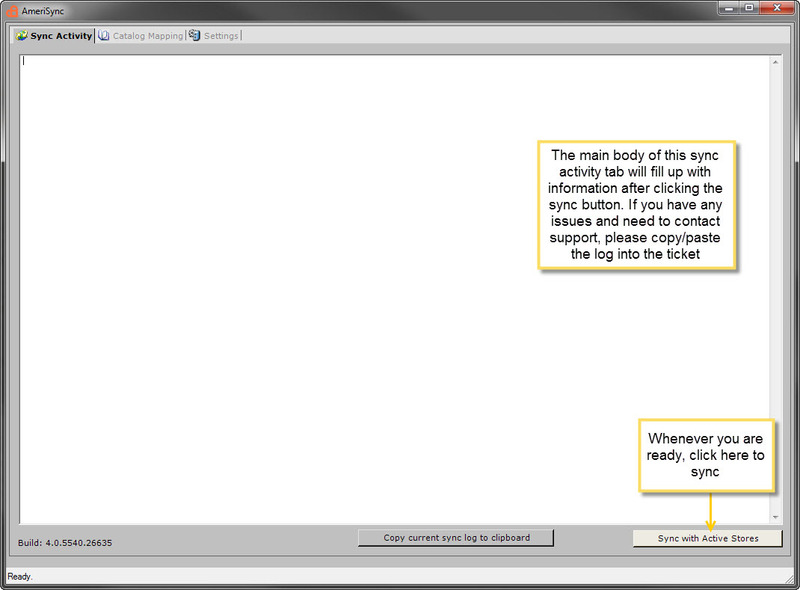 Only Sync Orders After - This is a setting under Tools > Apps & Addons > QuickBooks. If you imported orders from an older website, and don't need these to import into QuickBooks, input the last order number that does not need syncing. This will sync every order after the number that is input. Store URL - A setting inside AmeriSync. You will want to take your site domain, and add /store/admin/webservices/ameriquick/AmeriQuick.asmx to the end. So if your website is "www.mydomain.com" the URL would be http://www.mydomain.com/store/admin/webservices/ameriquick/AmeriQuick.asmx. To begin, you will want to download the Amerisync application. After downloading, log into your admin panel and go to Tools > Apps & Addons > QuickBooks. Here, you will see options and settings to connect over to Amerisync. Note the AmeriSync Login and Password field are not your AmeriCommerce online store admin credentials. You are setting your credentials here, and then input them into AmeriSync. You can check the Enable button whenever you are ready to start syncing. NOTE: Some features of AmeriSync will require that the QuickBooks file is open, otherwise you will receive an error. Now that we have login credentials ready start up AmeriSync. In AmeriSync, go to the Settings tab. Here you will need to give the Store a name, and set the StoreURL. This will be a specific path to your store. http://www.mydomain.com/store/admin/webservices/ameriquick/AmeriQuick.asmx - Note: You do not need to visit this URL address. You do however need to put this URL in the StoreURL field in Amerisync. Also remember to replace the "mydomain" part of the URL with your actual store URL. 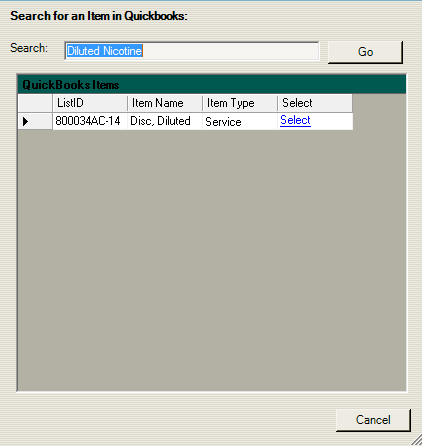 Enable the option to Sync Inventory if desired. Now you will want to input the username and password you created in the AmeriCommerce admin. Whenever you have all the information input, go ahead and enable the Active checkbox. 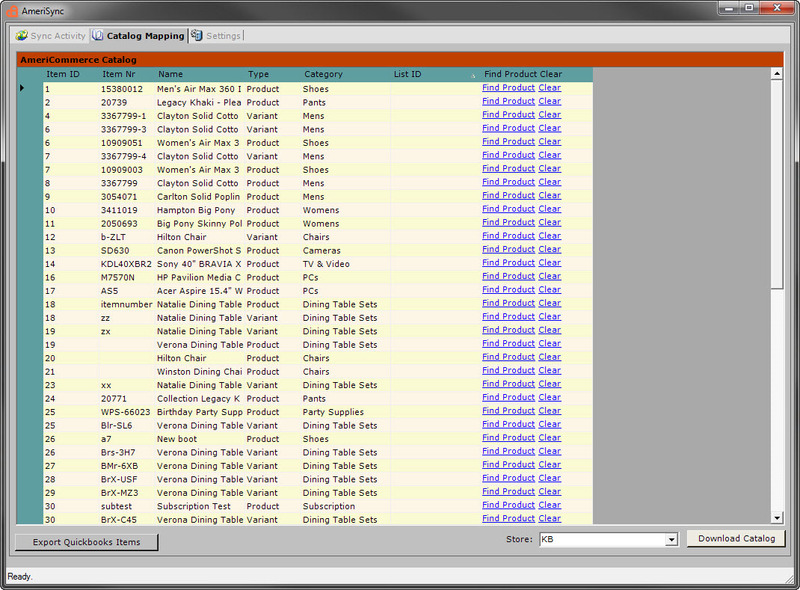 To begin mapping, open Amerisync and go to the Catalog Mapping tab. Choose the store from the dropdown in the bottom right, and click the Download Catalog option. If the settings are correct, it should pull a list of all your products from the AmeriCommerce system. To begin mapping your products, click the Find Product link. You should get a small window that opens in AmeriSync. If the product in QuickBooks has a similar name to the product on the storefront, then it should pull the information into this window. If not, you may have to change the search query. Whenever you find the respective product, click the Select option next to the entry. After mapping all the products, you should be ready to Sync! To Sync, go to the Sync Activity tab, and choose the Sync with Active Stores in the bottom right. You now have a synced database between AmeriCommerce online and your QuickBooks file!